On the way to the Mer de Glace lies the ‘Vallee Blanche’ point. It is a famous off-piste skiing spot. The ski route is around 20 kms. 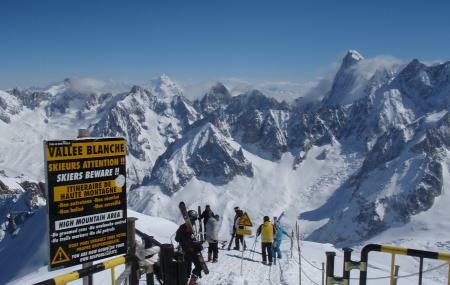 long with a vertical descent of about 2700 m. It is an unmarked, unmaintained, unpatrolled and unchecked high mountain off-piste ski spot which offers the most spectacular views of the Mont Blanc range. The route is recommended only for advance skiers. Cable car ticket, equipment rentals and guide fees apply. The recommended time to visit and to beat the rush is to visit mid week instead of a weekend. How popular is Vallee Blanche? People normally club together Lake Gaillands and Espace Tairraz while planning their visit to Vallee Blanche. People also prefer to end their day with Vallee Blanche. we been one night at September, we ordered last moment in the hotel itself. Miriam was helpful and charming. the room was clean, the view from the room great! quiet, comfortable beds. recommended, good value for money, (110 euro for 2 adult and 4 years child). This beautiful hotel is located in the downtown core of Chamonix. The rooms are quite large, recently renovated with a mix of old fashioned and modern decoration. The area is quite clean and well maintained. On one side of the hotel there is the river which gives a soothing white noise at nights. The Continental breakfast was one of the best I'd had in the Mont Blanc area with fresh bread, good coffee and tea, scrambled eggs, bacon and done fruits. All in all it was a nice stay. Very friendly cozy little hotel with lovely staff and a nice little bar and dining area. Reasonably priced with recently refurbished warm, comfortable, quiet rooms. Everything within a few minutes walk. Bus stops nearby. Many bars and restaurants to choose from just a stones throw away. Highly recommended.